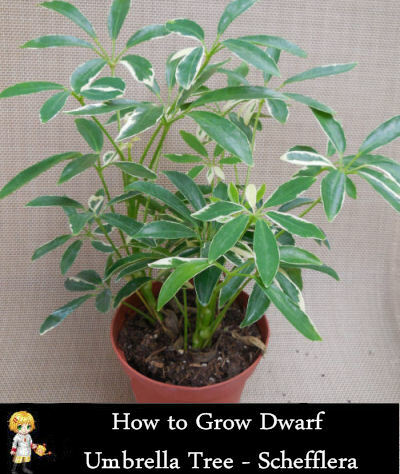 This Umbrella Plant is Easy to Grow. All Scheffleras are outstanding and easy to grow indoor plants. In temperate locals, they are large and graceful tropical plants. In colder climates, they are often used in interior decorating for the homes and offices. They are superb and long-lasting houseplant and easy to grow. 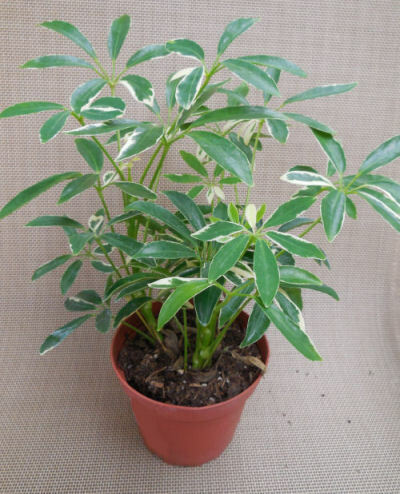 Schefflera arboricola ‘Capella’ is also known as a dwarf Umbrella plant. The leaves form in clusters of 7-9 leaflets and, looking at them, it is easy to see why it is called an umbrella plant. Temperature: Keep above 40 degrees F. Not hardy in most zones below zone 9. Watering: Keep evenly moist. Don’t let it either dry out or sit in water. Fertilize: Add an all purpose fertilizer monthly when actively growing. Size: Grows to about 3 feet tall and 2 feet wide indoors. Light: Bright filtered light. 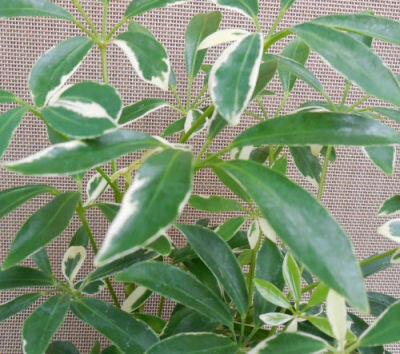 The variegation is best when the plant is near a window. In low light the leaves are more likely to be mainly green. Pruning: Prune regularly to keep the plant bushy. Humidity: Additional humidity in the form of misting will mean a very healthy plant! I need to re pot the plant,i have had now for a year. I need to know what kind of pot and soil to use. It’s a indoor plant. one of my stalks is mostly brown and the stems of leaves are really dropping. Should I prune it or just cut the stalk. It looks in bad shape. Can I use scissors to cut the stalk or just add water and more fertilizer. The other two stalks look pretty good. How do I prune it? Can I save this plant? Hi Janis. Brown stalks can be either a case of overwatering or underwatering (apart from major diseases) If the stem is mushy and brown, it’s been watered too much. IF it’s brittle and brown, this indicates lack of watering. It is not a good idea to fertilize damaged plants, especially this time of the year. You can cut the stalk, but it will send up two new shoots at the point where you cut them, which will change the look of the shape.